High quality 304 L stainless steel. 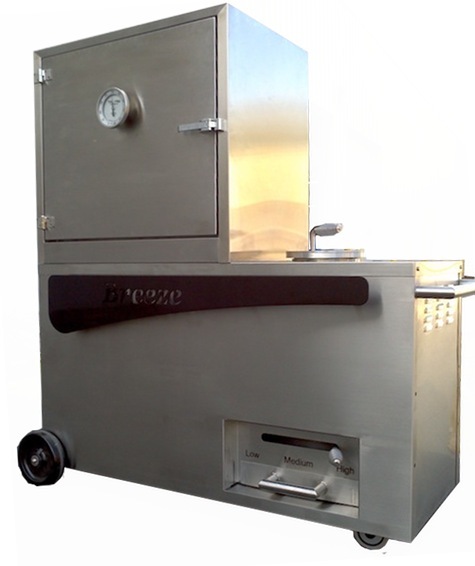 Never touch charcoal or wood again with the Breeze’s conveniently located, large opening, large capacity fuel reservoir. 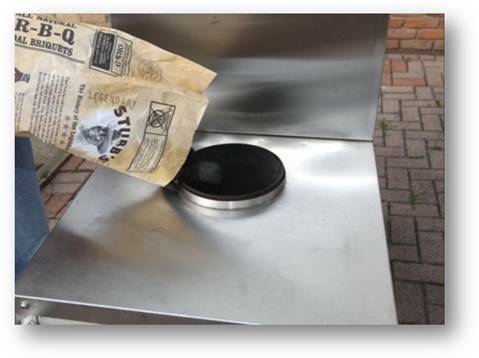 With the capacity to hold an entire bag of charcoal or wood, you’ll likely only have to add charcoal one time! On top of that, clean-up is equally a Breeze with a conveniently located stainless steel liquid cup and ash pan that offer large handles with easy pour spouts. Constant temperature throughout the oven. With its fully insulated oven and patented temperature control technology, your food cooks more evenly than your indoor oven. 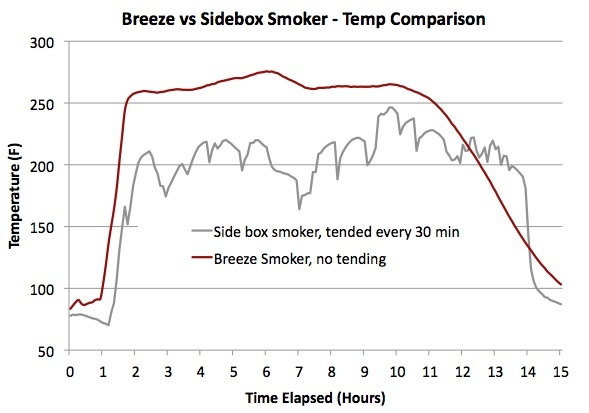 Heat rises, but the Breeze’s design forces air out the bottom of the chamber, causing air to swirl around your food. This results in uniform cooking everywhere in the unit. * The only time you’ll move your food is when you put it in and take it out. Cook any style you want, any time of the year. 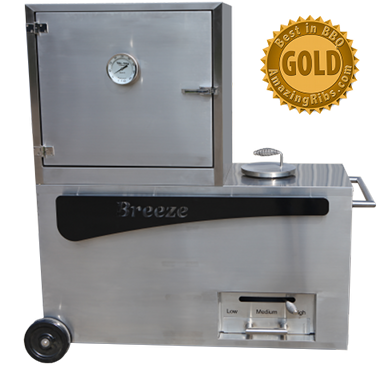 At a load of 2 racks of ribs or 1 pizza, the Breeze can cook from 200F slow smoked ribs to 450F high temperature baking and pizzas, with even perfection. Fully loaded, the Breeze can easily handle 15 racks of ribs at 225-250F . 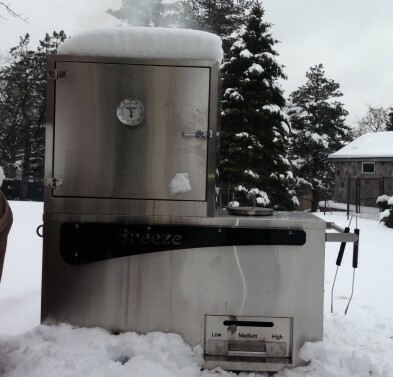 With the insulated oven and isolated exhaust, the Breeze cooks the same year round, even in rain, sleet or snow. The Breeze has over 5 cubic foot of interior cooking space, plenty of capacity for family, party, or small business cooking. Wood. Charcoal. No wires. No gas. This unit can use your choice of regular charcoal, lump charcoal, and wood chunks to produce the best flavors using a natural heat source. 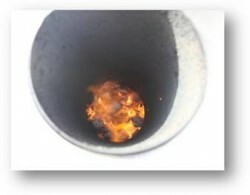 The fuel burns in the burning chamber, and fresh wood or charcoal drops in from the cylinder as the fuel in the chamber turns to ash. 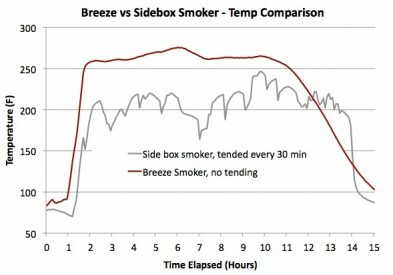 The Breeze’s design was a top reader design in Popular Mechanics in July of 2009. Click here to see the write-up!